Background Information - WHAT IS SAS? To understand genetic testing results, first it’s important to understand what some of the nomenclature used means. DNA: The information in each of our cells that tells the body how to make and control proteins is written in a code stored as a chemical called Deoxyribonucleic acid (DNA). Gene: A section of DNA that gives instructions for making a particular protein. SATB2: When in UPPER CASE and italics, it represents the human gene. SATB2: When in UPPER CASE only, it represents the human protein produced by the gene. Proteins are the building blocks of the body. Satb2: When in lower case and italics, it represents the animal gene (typically mouse). Animal genes are studied by scientists to understand how a gene works. Satb2: When in lower case only, it represents the animal protein produced by the gene. Chromosomes: Where the DNA information is tightly packed in genes. Humans typically have 46 chromosomes in each cell, divided into 23 pairs, one copy inherited from each parent. Chromosomes are numbered 1 -22 and the final pair are the X and Y chromosomes. All human chromosomes have 2 arms: a short arm (“p” arm) and a long arm (“q” arm). Chromosome coordinates or breakpoints: There are typically two ways in which Geneticists describe the location of a gene on a chromosome: 1. By using the location in the chromosome based on a special pattern of bands created when chromosomes are stained with certain chemicals; 2. By using more precise description of a gene’s position on a chromosome based on the sequence of DNA building blocks (base pairs) that make up the chromosome, typically through a special test called microarray analysis. Microarray, array CGH, or SNP array: is a relatively newer technology that allows more precise definition of what is “missing” or “extra”. Exons: the coding regions of the gene that provides the instructions for amino acids. The SATB2 gene has 11 exons (depending on the nomenclature this number may be slightly different). Aminoacids: all the proteins in our body are formed by pieces called aminoacids. The protein produced by the SATB2 gene, SATB2, has 733 aminoacids. Nucleotides: The letters of the DNA code (nucleotides) always are A, C, T, or G. A group of three nucleotides (like GAA for example) is called a codon and is unique to a particular amino acid. Genes have this sequence of letters or instructions in the exons. Heterozygous: refers to the fact that only one copy of SATB2 has a given change and the other copy is “normal”. de novo: means neither parent has the same gene change and so, it was not inherited. The SATB2-associated syndrome (SAS) is caused by alterations of the SATB2 gene. 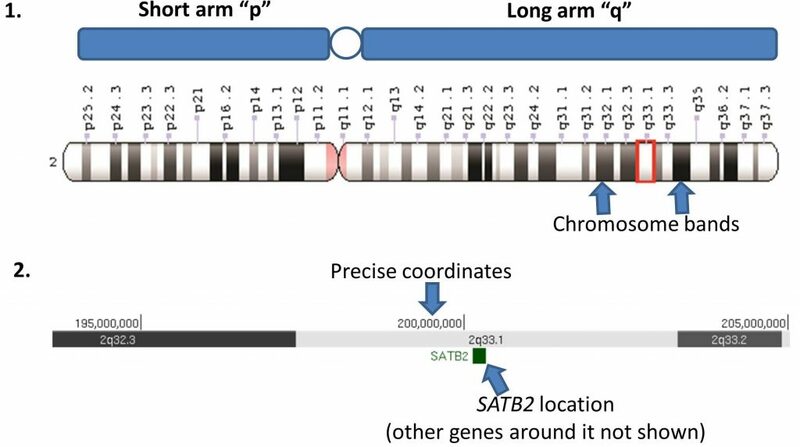 This gene is located in chromosome 2 at position q33.1 and produces a protein called SATB2.